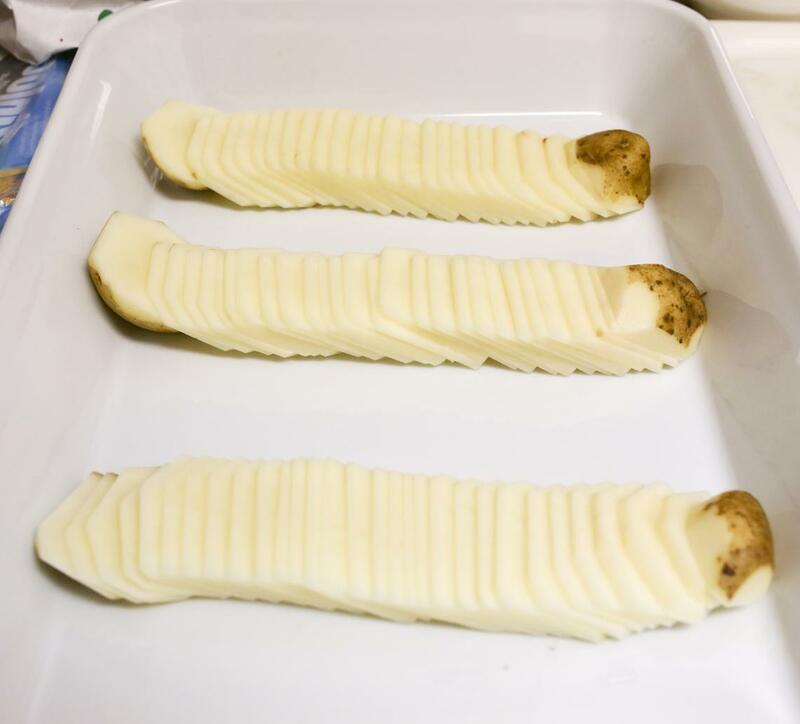 Cooking potatoes can be a bit of a fuss, between the peeling, the boiling, the mashing, and the subsequent clean-up of the pots, bowls, and utensils associated with each of those steps, which is why we almost never make them. Potato Dominoes, however, ranks up there as one of the least fussy and most delicious potato recipes we’ve come across. Like most of our favorite recipes, it requires just a few every-day ingredients, takes little time to prepare, and lets the oven do most of the work. The dish really is so simple that you won’t believe how delicious it comes out when it’s done. We like to think of it as an elegant cross between a baked potato and a potato chip: the edges of each thinly sliced potato are crisp and brown and just a little bit salty while the insides are soft smooth and just a little bit buttery. Honestly, they’re pretty addictive. Every time we make these potatoes, whether at a summer barbecue (they are perfect with a steak), a holiday meal, or a dinner party, we can barely set the dish down on the table before my family and friends start grabbing pieces with their fingers. Our family goes crazy over this recipe, and I’m sure yours will too! We usually go with Yukon Gold potatoes when making these, but they are just as delicious with sweet potatoes too! 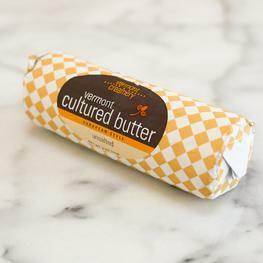 Clarify the butter: Slowly melt butter in a small saucepan over medium-low heat. Remove from heat and skim off any foam from the top. Pour butter through a fine-mesh strainer. Discard solids. 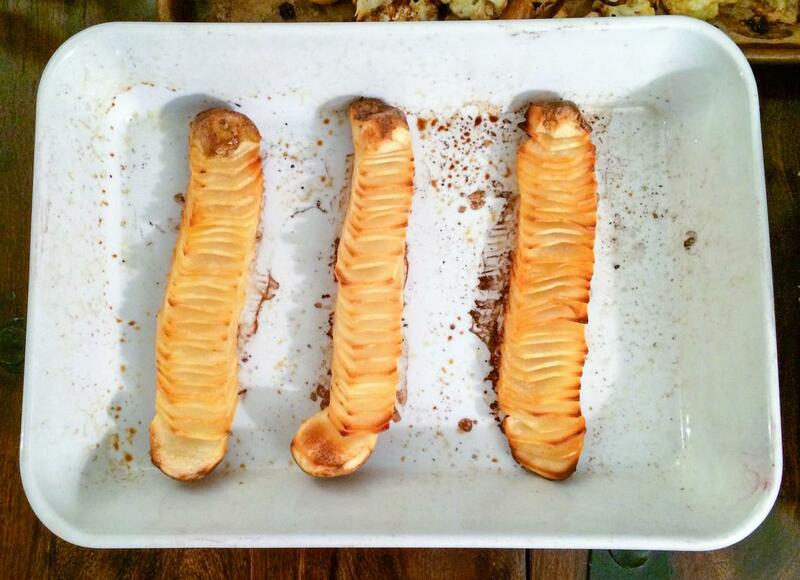 Cut the two ends of one potato and reserve them. 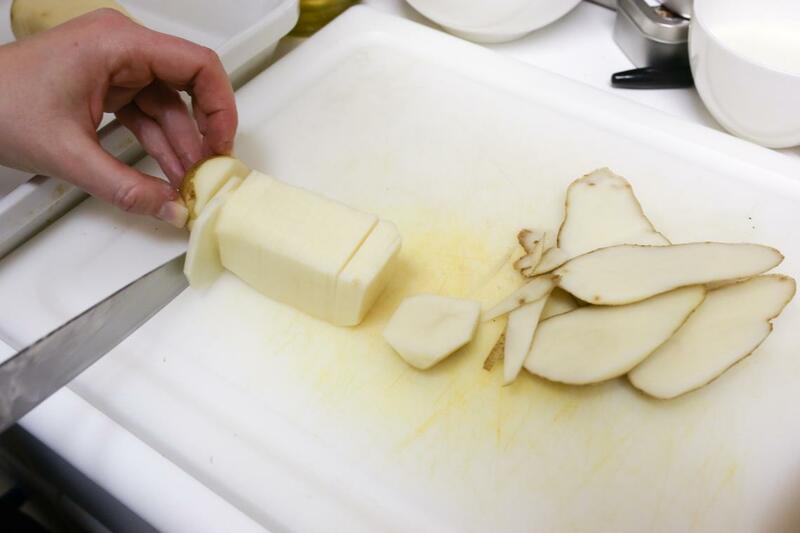 Trim the four sides of each potato to form a brick. 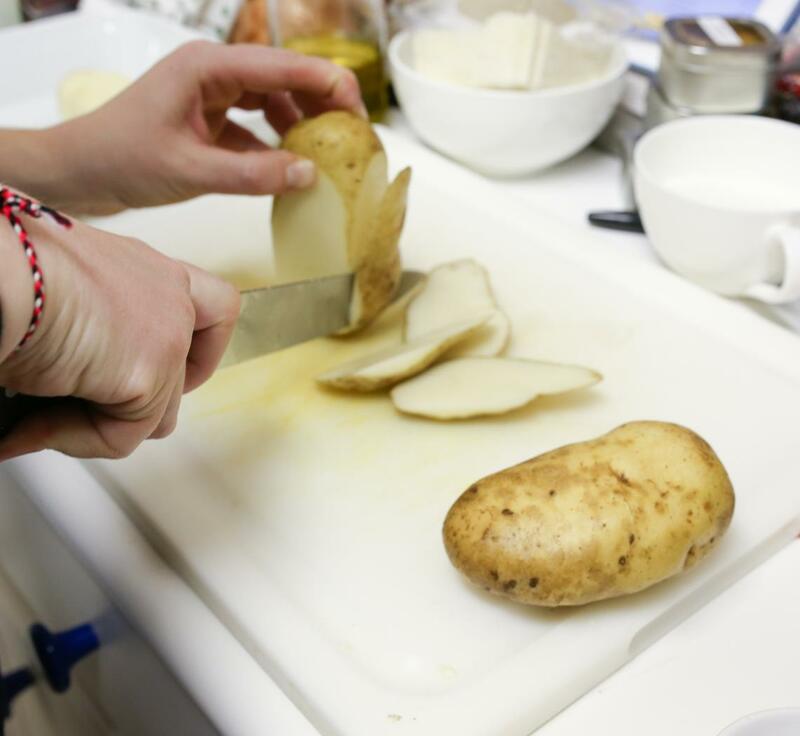 Slice the potato about 1/8” thick on a mandolin or by hand if you are comfortable with your knife skills. Either way, be sure to keep the slices in order like a stack of dominoes or a deck of cards. Lay the sliced brick on a lined, rimmed baking sheet, placing the reserved ends on either side to keep the dominoes in place. With the palm of your hand, angle the slices so that they resemble a line of dominoes that has tilted over. Repeat with remaining potatoes, keeping the stacks at least 2” apart. 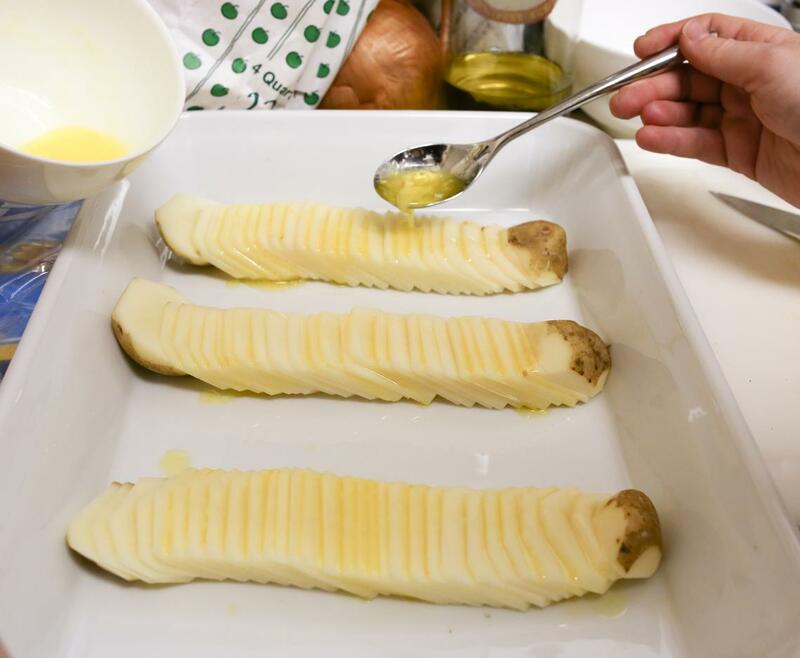 Pour the clarified butter evenly over the potatoes. Sprinkle with salt to taste. 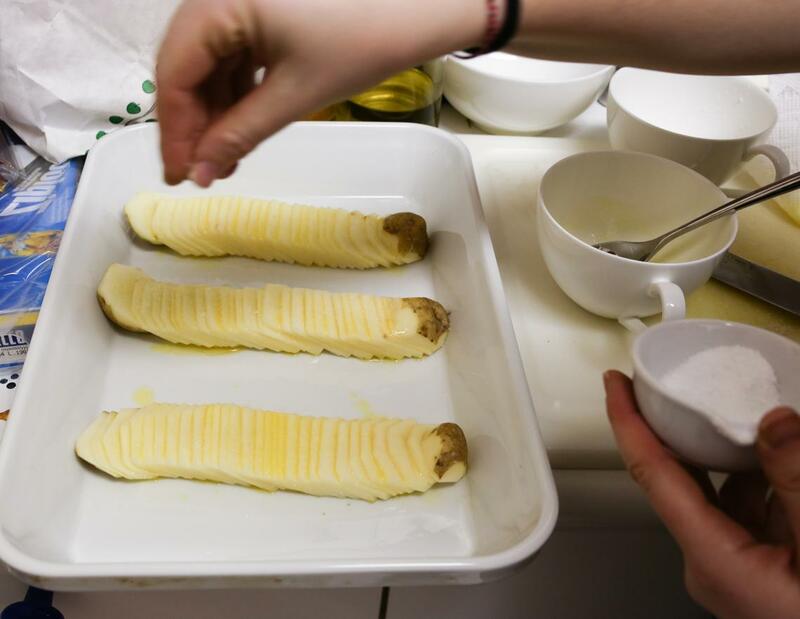 Bake for 40 minutes or until the potatoes are browned on the edges and tender in the middle. Serve immediately.